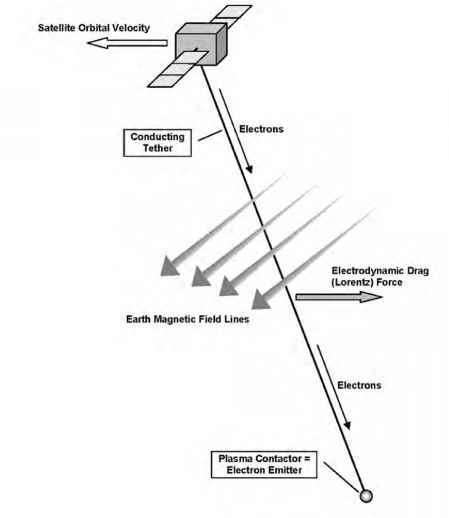 As described in Chapter 1, a sensor pod towed by a tether satellite could be used to investigate layers of the upper atmosphere that are too dense for satellites to orbit through. In 1998 Delta-Utec and Tether Applications presented a more advanced idea, involving a daisy-chain of up to eight research subsatellites connected by tethers to a larger mother satellite. This would enable synchronized, multipoint measurements in the upper atmosphere. They called their idea LADDERS, an acronym for Low-Altitude Daisychain-Deployed Expendable Research Satellites. The total tether length could be something between 40 and 100 km (25 and 60 miles). Deployment would start with the ejection of one subsatellite from the mother satellite vehicle. Ejection with a speed of about 1.5 meters per second (5 feet per second) would provide enough momentum to deploy over 1 km (0.6 mile) of tether from a miniature version of the flight-proven SEDS deployer (as used on the experimental missions SEDS-1, SEDS-2, and Tether Physics and Survivability [TiPS]) mounted in a second subsatellite still attached to the host vehicle. After deployment of the first kilometer the tension in the tether due to the gravity gradient will be sufficient for continued deployment; the tether will be rolled out automatically. Full deployment of the first tether segment would then trigger the ejection of the second satellite, which in turn would pull out a second tether segment from a deployer in the third satellite, and so forth. The lower the subsatellites could reach down into the upper atmosphere, the more useful the scientific data but the higher the aerodynamic drag. Due to the amount of heat created by drag, the lower limit for LADDERS was determined to be an altitude of about 125 km (80 miles). Most of the drag would be experienced in the bottom 15 km (9 miles) of the tether chain, which has to be compensated for by a sufficient amount of mass orbiting at higher altitudes to prevent the system from de-orbiting too soon. The lower tether segments would need to be very thin to reduce the air drag as much as possible. They could consist of a single tether strand of about 0.4 mm (0.016 inch) thick. Having single-stranded tethers in the lower parts leads to a 10 percent risk of losing, within 2 days, a lower satellite by a meteoroid cut. On the other hand, the use of a thicker tether or Caduceus at the bottom segments shortens the nominal mission duration by 30 percent or more. A detailed trade-off between the risk of losing a satellite and a longer mission duration would thus be an important issue for the detailed design of a LADDERS mission. The upper tether segments that are less affected by drag could be made of a thicker multistrand Caduceus tether (as used in the Young Engineers' Satellite [YES] project). chain system would get an up-boost, enabling it to stay in orbit for up to another day. Another possibility to increase the lifetime of the system is to compensate the drag using rocket thrusters.